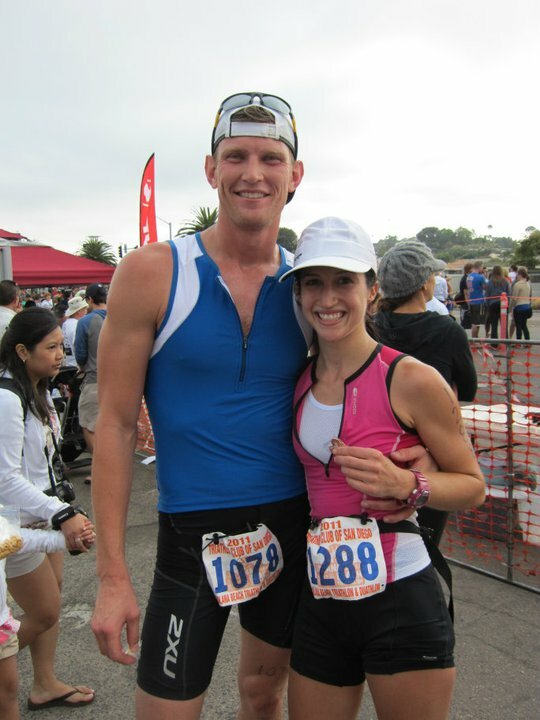 Solana Beach Sprint Triathlon Improvement! A couple of weeks ago I completed the Solana Beach Sprint Triathlon for the second year in a row and saw a HUGE improvement over last year! It makes me smile to see how far I’ve come. 🙂 🙂 Last year this was my first sprint triathlon EVER, so this was officially my 1 year triathlon anniversary. I definitely felt WAY more confident on the swim and bike, and even managed a sneak faster run in there too. I also had a bike that fits me! The morning started off with an early wakeup call and a stop at 711 for coffee. This was my first time having coffee before a race. It’s not a normal thing for me, but I’m tempted to make it a regular thing because I heart coffee. We then road our bikes to the start (about 4 miles away) and spent some time setting up our transition area. This was my first race post-Ironman, and it’s amazing how different a sprint is. Yes, I know it’s obviously, but you hardly have anything to set up, and you don’t have to worry about nutrition! I spent a lot of time chatting with people before the race because I ran out of things to do. I was more excited than nervous for once. Solana Beach – Team “No Wetsuit”! This is considered a beginner friendly race, which is why I decided to do it last year. (Around this time, Team WODS was also formed!) This year I was able to be more competitive but also relax and have more fun since I wasn’t afraid of the ocean or of crashing my bike with my clip in pedals. I cried the first time I did an ocean swim last year….Yes, that was just last year! I think I succeeded in both goals! This was my first time doing an ocean swim without a wetsuit, so that was the #1 thing I was nervous about. #2 was the knee pain I had been having. Ultimately, I decided it would be worth it to attempt a non-wetsuit swim in this environment since I have to do that anyway for Ironman Cozumel, and practice makes perfect. The main difference is that will be about 2,600 of my closest friends and 2.4 miles versus 60 triathletes and 1/4 mile, but who’s counting? I continued to push myself hard through the entire race because my knee never started hurting (yay! ), and I’m very competitive. (I can’t help it.) I had fun counting off the number of women I passed from my age group (25-29). The only time a girl ever passed me after the swim was when she was going to finish her run. I followed her until she went to the finish line and I started loop 2. I think she placed top 3 in my age group. While I’m a much faster and more confident swimmer than last year, I’m still not “fast” by any means, and I am probably below average in the triathlon world. Therefore, I made up my time a little bit on the bike, and even more so on the run. Another fun personal success was that Jeremy didn’t pass me this year. His wave started 10 minutes behind me, and last year he passed me towards the end of the run. I finished about 100 yards ahead of him today. Close call! We both improved from last year. I definitely recommend this triathlon for all ability levels. I had fun both times and I plan to do it again next year! It’s a great local race. The boys like it too! 1. Don’t drown during the 400m ocean swim. 2. Don’t fall off the bike during the 9 mile ride. 3. Run as fast as I can during the 5k. I’m happy to report that I accomplished all those goals!! I didn’t spend too much time training for my first sprint – approx 5 weeks – but it went really well. Below is a little bit about each leg along with my split times. I’ve never been a swimmer. 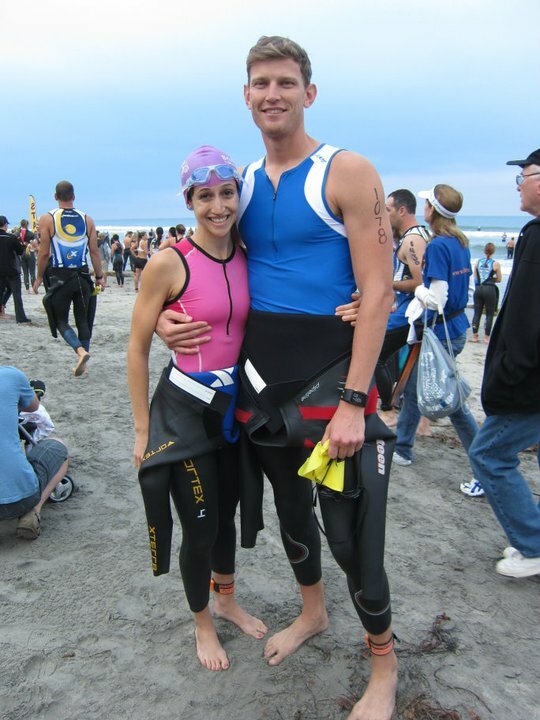 Before I started triathlon training, I rarely even went into the ocean past waist deep. Just ask my friends that went to Rio with me earlier this year. Even in the scorching heat, I was a sand girl all the way. Waves and current were simply not for me! Part of the commitment I had to make with my triathlon training, however, was getting over my fear of open water swimming. I literally dove right in and did my first two races in open water (bay and ocean) with very little training. Needless to say I am much less afraid of open water swimming, and neither experience was traumatic. I love swimming in a wetsuit. I feel like it keeps me safe and warm! (It essentially acts as a floatation device making it easier to swim.) I felt good getting out of the water knowing I had conquered my fear. I finished the swim portion of the triathlon behind all my friends, but I was happy I wasn’t the last one out of the water (and that I didn’t drown). I entered the transition area to change from swim to bike and felt a little light-headed when taking off my wetsuit. I think my body was still getting used to all the swimming, so hopefully the swim dizziness will subside the more I train. I successfully got on my bike and clipped in without falling (success!) and was on my way for the 2 loop course. I worked on pedaling as fast as I could and not getting passed. I’ve been getting more and more comfortable on the bike over time, and the best thing is that there is a lot of room for improvement. It’s important that I get my speed up before my Ironman. The faster I go, the less hours that my booty will be on the bike! 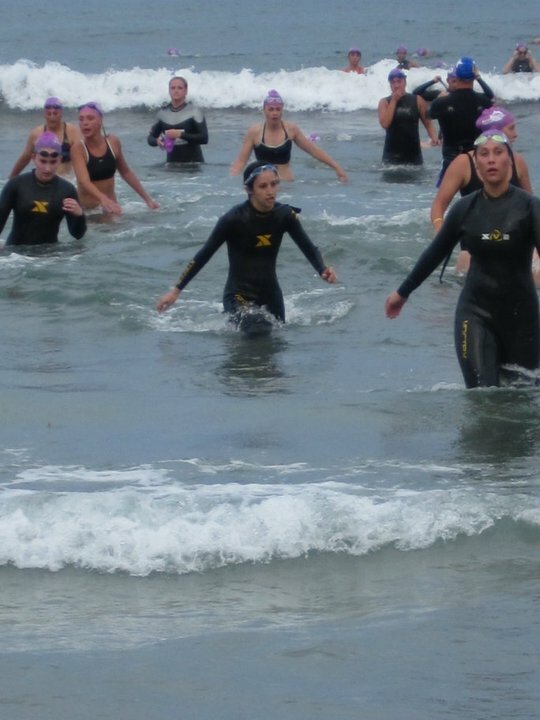 During Solana Beach, I started gaining ground and passed several girls in my age group that were out of the water before me. My legs were pretty strong after marathon training and P90X. I was very excited for the final part of the triathlon because it’s my strongest area of the triathlon. I just completed a full marathon 6 weeks earlier, so I wasn’t worried about a 3.1 mile run. It was definitely a weird feeling running immediately after riding a bike, but that didn’t stop me from finishing strong and passing more girls in my age group! I finished with a time of 1:14:31 and placed 34th in my age group. Solana Beach sprint triathlon is a very good race for beginners looking for a little extra challenge with the ocean entry swim. I had so much fun the entire time I raced and was fortunate enough to have my family there cheering me every step of the way. I’m so happy they support my crazy fitness endeavours, and I bet they can’t wait to join me in Coeur d’Alene for my full Ironman next year! 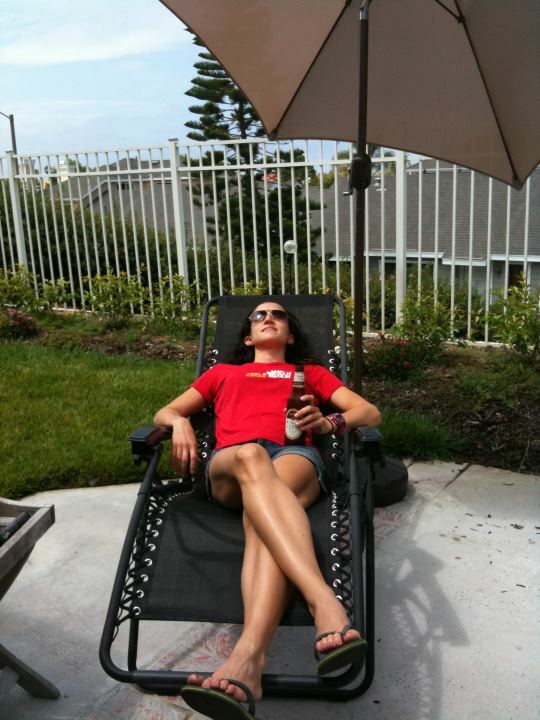 Until then, I will be ramping up my training and rewarding myself with a cerveza or cupcake every now and then.